You see, I did my best to get through all of the fifteen titles, but in the end I was only able to notch up fourteen, my library, which had been amazing up to this point, failing to get my purchase request back to me on time. Luckily, they didn’t give up – and neither did I. This post is review number fifteen; so, have I saved the best for last? 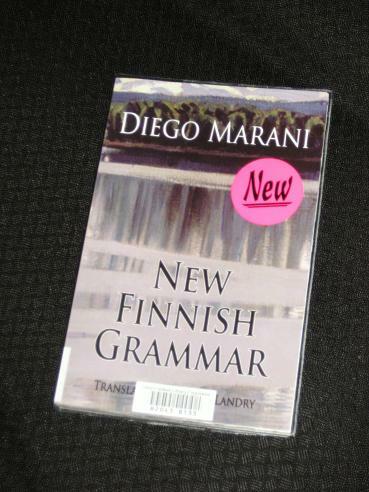 New Finnish Grammar by Diego Marani (translated by Judith Landry) was shortlisted for the real prize, beaten to the award by some book I don’t particularly wish to talk about now. The story is set during the Second World War, but the plot actually has little to do with the war. We are presented with a journal of sorts, written in Finnish, with an introduction and frequent commentaries from a navy medic, Doctor Friari. The main writer is Sampo Karjalainen, a Finnish sailor (and amnesiac) found in Trieste after having been attacked and left for dead. When the good doctor, a native Finn, sees the name sewn inside the sailor’s coat, he realises that he must be a countryman and promptly decides to nurse him back to health – and teach him a little of the native language he appears to have forgotten. Once back in Helsinki, Sampo sets about mastering the notoriously tricky Finnish vernacular, hopeful of recovering his memory and his past. That depends of course on whether he has one – and whether Doctor Friari’s assumption was correct.. I loved this book, but considering the subject matter that’s not a huge surprise. My background is in linguistics and intercultural communication, and the vital connection between language and culture is the cornerstone of the novel. Poor Sampo is adrift in a strange world, bereft of his early experiences, and he clings to the language he has been told is his, desperately trying to master in the space of a few months what would normally take an adult a lifetime. As much as the story is about Sampo and his struggles though, it is also about those characters who attempt to help him, unable to avoid the temptation of scribbling on the tabula rasa of his amnesiac personality. Doctor Friari, a Finn forced to leave his homeland after the civil war, sees what he wants to see when he stumbles across poor Sampo, desperate to redeem himself and his family in the eyes of a fellow Finn. Hmm, I was a bit underwhelmed by this one. It was all the kalevala stuff that grated, rather than the linguistics, though. Hmm, I found it rather underwhelming, but each to his own! Enjoyed this one also, but then I've an interest in Language etc. but beyond that this was just a good read. I have a copy of this and am really looking forward to it. Thanks for the great review. Nice review, Tony – I've been meaning to read this one for ages, and this has convinced me that it's time to give it a try. Ooh, this sounds fantastic. I don't have any training in linguistics but it definitely interests me. Thank you, by the way, for your detailed analysis of all the books in this prize list. I have added half of them to my wishlist!